probably explain the bare walls and modern-on-traditional light fixtures. Sal was obsessed with the walls, constantly complaining that there should be wallpaper. It really didn't bother me, I was more interested with the food. We had an early reservation for 5:45pm and the place was packed during this time. The reason? Between 5:00pm - 6:00pm, there is an early bird special consisting of 3 courses for $28.00. A pretty good deal in my books. I decided to order off the menu because I wasn't really in the mood for dessert. Actually, Sal was planning on taking us to Bi-Rite afterwards, so my "no dessert" idea was more strategic than anything. Prior to our appetizers, we were treated to complimentary amuse bouche in the form of a Creamy Corn Soup. Cable Car Guy was running late and they actually brought him his soup when he arrived. Moreover, they encouraged us to order for him before the 6:00 cutoff time for the early bird special. We liked how they took care of everyone, even the one that wasn't even present. I got the PEI Mussels Soup as my starter and I was pleasantly surprised at how many fresh, plump mussels rested in the aromatic broth with a slight hint of heat. The addition of creme fraiche was a nice touch as it gave the soup some body. 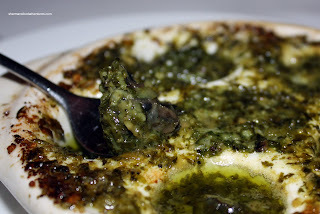 Cable Car Guy went for a classic - Escargot de Bourgogne in Butter-Parsley & Garlic Sauce. It was a bit hard to take a picture of it since each escargot were covered with plenty of butter and parsley. However, that made for some good eating, especially dipping the bread in the remaining sauce. For my entree, I had the Skate Wing in Brown Butter. It was served with fingerling potatoes and finished with a Grenobloise sauce. The skate was moist with a slightly crispy exterior. It was slightly on the overcooked side; but not terribly so. The capers, shallots and lemon juice (?) added both aromatics and tang. and got the French Toast. Yes, French toast in a French restaurant, go figure... It was finished with a rich caramel sauce with hazelnut ice cream. I normally do not go OMFG over French toast; but I will here. Pure buttery, sweet and slightly crispy heaven which would blow any calorie restrictions. Chef and owner Philippe Gardelle greets and welcomes every guest sometime during their meal. He is a gracious host and shows his appreciation for their patronage. In fact, when he found out that Sal lost her leftovers, he marched straight into the kitchen and made up a partial portion for her to take home. I really enjoyed my dinner at Chapeau! from the food to the service. Combine this with reasonable prices, especially with the early bird, you really can't go wrong here. wow, that's some good service. i know a lot of places that really wouldn't care if the leftovers got dumped. french toast looks incredible too. who would have thought something so simple could make such an incredible dessert? I know! We were pleasantly surprised that the chef/owner cares so much. Yah, excellent French toast in a French restaurant, who would've thunk?